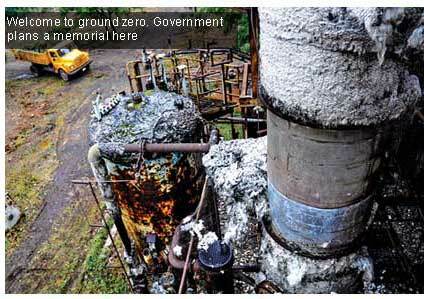 Ground zero of the Bhopal gas disaster, the defunct pesticide factory, will soon be opened to the public, says the Madhya Pradesh government. It will be converted into a memorial. A Delhi-based architects proposal for the memorialwhich includes an exhibition gallery, a walking plaza showcasing cast-iron figures of victims, viewing towers and bazaarshas been judged the best in a competition held by the government. The proposal awaits clearance. This will dispel the myth that there are toxins left at the site, S R Mohanty, principal secretary of the Madhya Pradesh government, told Down To Earth . The city is abuzz with rumours that the site spread over some 35 hectares is prime real estatethe factory is in the city.The city wants the land. For over 20 years after the disaster, nobody paid attention to the hazardous waste lying at the now dead and deserted factory. Long-term poisoning and clean-up came up during the hearing but were not the focus. The focal point was compensation and building a hospital, said Ranganath Misra, former chief justice of India who was in the bench that pronounced both the critical judgements of the Supreme Courtin 1989, when the settlement was made and then in 1991, when the court agreed to reinstate criminal charges against the company, Union Carbide. In the mid-1990s, some 10 years after the disastrous night, Union Carbide sold the shares of its Indian company. In 1997, Eveready Industries India Ltd, which bought the shares of Union Carbide, commissioned to the Nagpur-based National Environmental Engineering Research Institute (neeri) a study of the contaminated site. It is still not clear why this study was commissioned, but some say the plan was to set up an electronic factory. The report available with activists in Bhopal shows that neeri did find pesticides, from Sevin (carbaryl) to lindane and alpha naphthol. neeri officials confirmed to Down To Earth that they had indeed found high levels of toxins and had identified the hot spots of contamination in the factory. Then in 1999, the global ngo, Greenpeace, conducted a similar study in and around the factory. This report also confirmed contamination on a massive scale. This was also the time when the big sale was taking place Union Carbide was sold to The Dow Chemical Company, another US chemical giant. Citing the findings of this report, Bhopal activists took the matter to the New York district court. They demanded relief for personal injury and property damaged because of continuing release of pollutants from the factory. The battle in US courts continues till date. But in 2004, Alok Pratap Singh, an activist in Bhopal, filed a public interest petition in the Madhya Pradesh High Court. He petitioned that Dow be held responsible for the pollution at the site and sought directions from the court establishing the liability of the company for continuing and long-term impacts. His petition also asked for quick clean-up of the site. Since 2005 the Jabalpur bench of the Madhya Pradesh High Court has issued several directions for the removal of the waste.The first step was to direct neeri to check the toxicity of the waste and suggest actions for remediation. The contract for the first phase of clean-up was awarded to Ramky Enviro Engineers Limited, a Hyderabad company. It is not clear how the company decided what waste it should collect and then store. But it seems that waste already collected in the early 1990s was repackaged and stored under a secure shedwhich leaks. So every time it rains the waste seeps into the soil. The company officials are on record explaining the broken roof government contractors built it. The court also directed that the 390-odd tonnes of waste collected should be treated and in 2007 ordered that the incinerable waste be sent to a private facility in Gujarat. (40 tonnes of the waste has been sent to the Ramky-owned landfill in Pithampur in Dhar district of Madhya Pradesh.) Since then a controversy has been raging about the adequacy of the waste-disposal facility of Bharuch Enviro-Infrastructure Ltd (beil) in Ankleshwar in Gujarat (see Bhopal to Bharuch, Down To Earth, April 30, 2008). Environmental activists have alleged that the facility, which saw a major accident over a year ago, is poorly maintained. Gujarat, which initially gave permission for transport of hazardous waste from neighbouring Madhya Pradesh, has also refused waste, saying the facility is over-extended and unavailable. beil owner Rajju Shroffs private ngo, the Centre for Environment and Agrochemicals (centegro) has also intervened in the legal case without disclosing its related interests. A Right to Information application by Bhopal activists found reams of evidence showing how centegro lobbied with the Union chemicals and fertilizers ministry to allow the waste to be sent to beil. It is only in early 2009 that Shroff, in a letter to the Union government, admitted that his companys facility is inadequate and strained because of existing waste disposal commitments. In light of this it will be difficult for us to take further waste from outside the (member) industries for incineration, he wrote. This was after the high court threatened to issue contempt orders against Gujarat for refusing the waste of Bhopal, and the Gujarat government appealed to the Supreme Court. The apex court has stayed the contempt proceedings of the Madhya Pradesh High Court and is hearing the matter where will the waste of Bhopal be disposed of and who will pay? The Bhopal Group for Information and Action, an ngo run by Satinath Sarangi, who has for long worked with victims of the disaster, wants the court to send the waste back to the US. He said in his application India has done this in the past. In March 2003, the Tamil Nadu Pollution Control Board ordered Hindustan Lever Ltd to export 256 tonnes of waste containing mercury to a facility in the US at the companys cost, said Karuna Nundy, Sarangis lawyer. Acting on the high courts directions, the Madhya Pradesh government asked institutions to prepare detailed plans for remediation way back in 2005. The National Geophysical Research Institute (ngri) is assessing the level of contamination in soil and groundwater; the Indian Institute of Chemical Technology (iict) is looking into ways to dismantle and decommission the plant; and neeri into preparing a remediation plan cost estimate. These studies are on. The state government would, however, like the world to believe there is no real contamination at the factory. On November 10, Babulal Gaur, the state Minister for Bhopal Gas Tragedy, Relief and Rehabilitation, announced a plan to open the factory gates for sightseeing and disaster tourism. This is to help people get rid of the misconception that chemical waste inside is still harmful or that the chemicals are polluting the water in nearby localities, he explained. Gaur cites as evidence a letter from the Defence Research and Development Establishment (drde) Gwalior, which says it found nothing alarming in samples it tested for toxicity in its laboratory. On the contrary, all samples excavated waste, lime sludge, naphthol tar, reactor residue, semi-processed pesticide and Sevin tar have low mammalian toxicity, according to experiments done on animals. drde director R Vijayaraghavan explains A 70 kg man will not die if he takes 200 gm of the waste orally or eats 100 gm of sevin tar. In fact, the toxicity is less than that of table salt. So the director concludes that the site can be opened to the public. Sarangis response We are now calling all government officials for a scrumptious lunch of the waste. The state pollution control board has also tested contamination. Over the years it has found varying levels of pesticides in and around the plant. neeri reports have also confirmed toxins in places at considerably high levels. But the state government says neeri has given it a clean chit. neeri officials clarified to Down To Earth that they never denied toxicity of the plant site. They only told the government the site is safe enough for temporary entry. Clearly, when interests are at work, denial is the best way out. 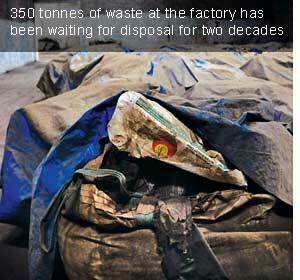 Thats how there is still no decision on the 350 tonnes of waste packed and stored. And certainly there is no talk of the thousands of tonnes scattered around the factory, seeping into the ground. This is slow and deliberate murder.